The manufacturing sector is a key industry which has the potential to affect the economy of any nation. A common problem faced by manufacturers is complex supply chain issues. Master data management (MDM) has the answer to their problem which can help improve the efficiency of such enterprises. The practice involves using technology to integrate the various systems to make accurate data available to all stakeholders. Some business owners are still not keen on hiring data management services to devise an information management program for their enterprise. 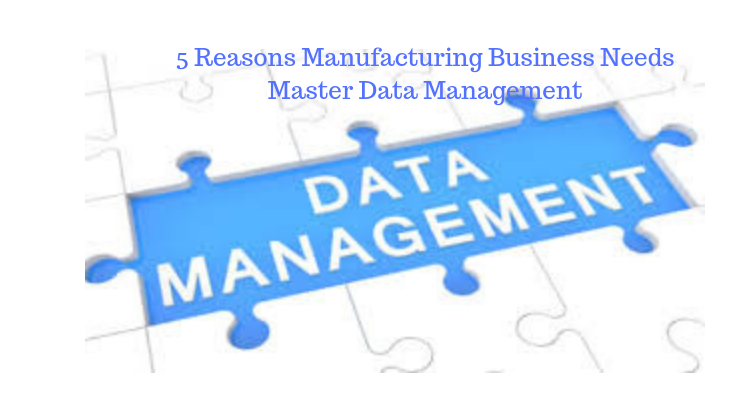 Following are a few reasons which demonstrate how applying master data management to the manufacturing sector can help meet business goals. The technology helps synchronize diverse digital information sources within a company like ERP, CRM, e-commerce, and marketing automation systems. At the same time, it helps deliver information to other entities like business partners or vendors. Moreover, it can be used by web solutions to provide customers with easy online access to the company’s products. MDM can help manage product data of various items, numerous customers and websites. The whole process has the capability to scale up the operations whenever the need arises. This does not affect the structured procedure which sanitizes data elements. The organization is ensured of access to consistent and high-quality data and at the same time, it can communicate accurate information to other entities quickly. Manufacturing is a complex business with numerous supply chains operating at any given time. A company may be sourcing raw material and components needed for production from various suppliers. At the same time, it will be involved in sending finished products to its network of distributors who will be relaying the goods further to dealers and retailers. This can lead to the generation and storage of information at numerous places. MDM provides a great solution to this problem. Once the system is in place, the complete value chain can be managed from a single place. Manufacturers are involved in sharing information with their partners such as vendors, distributors, retailers etc. They not only send but also receive data from these entities. The information management systems in place at these establishments may or may not be the same as the manufacturing company. This means that the data needs to be modified according to the other party’s system or vice versa. Master data management helps solve this issue by providing an easy way of data syndication. Even if the definitions and standards are different at the other end, MDM will synchronize the content with predefined data standards in an efficient manner. MDM helps provide high-quality and accurate data which can be used for improving the efficiency of different business processes. Manufacturers can understand the requirements of the end user to modify their products accordingly. They can get access to a piece of specific information like the time taken to deliver a product to a particular location. They can use the data to identify areas where they can expand operations and grow their business. This type of in-depth information will also help in data management assessment for gauging the efficiency of the whole initiative. Corporations can easily widen their horizons and cater to a global audience without too many hassles. MDM gives them a platform to make localized assessments by incorporating factors such as currency, languages, metric systems, logistics, and regulations. An appropriate MDM platform can be easily adapted to any business environment. This is helpful for businesses who have assets located in different countries. Master data management is extremely useful for manufacturing enterprises as it provides them with accurate information generated from trusted sources which provide a correct and complete picture.